Much is said every year about winter driving conditions and how cold weather affects a vehicle’s performance. 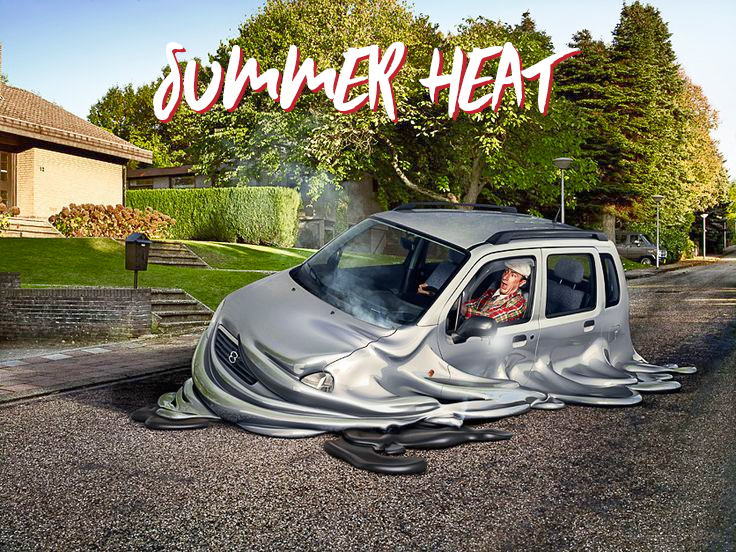 But summer heat can also wreak havoc on a vehicle and its function. The warm weather, hot roads, extended trips, and dry air combine to create a hostile work environment for your car. Here are a few things to consider as you hit the road during those hot summer months. Checking your tire pressure is one of the most important things you can do year round—but especially during the summer months. Hot tires on hot pavement are already a recipe for a blowout, but if your tires are improperly inflated, the risk of catastrophic failure is even greater. Help prevent hazardous situations by checking your tires once a month and replacing them before they become dangerously worn. Everybody knows that cold weather can be hard on your vehicle’s battery. But hot weather can also shorten your battery’s usable life. The extra vibration from long summer trips can also damage your battery. It’s always a good idea to carry a set of jumper cables, or even a battery jump box, so you don’t get stranded. Also, check your car’s battery terminals for corrosion, and make sure the battery itself is securely mounted. When you have your car in for regular service, be sure the technician tops off the fluid in your battery and tests it properly. A hot engine needs all the lubrication it can get, so keeping on top of engine oil changes is especially important during the summer months. Though some people believe it’s necessary to use a thicker grade of oil for summer (and a thinner oil for winter), this isn’t really the case with modern motor oils. The most important thing is to change the oil at regular intervals and use the oil viscosity recommended in the owner’s manual for your car. With the extra miles many people put on their vehicles during summer road trips, this may mean more frequent changes. What we call “antifreeze” during the winter doubles as “coolant” during the summer. Low coolant levels can literally kill your engine. Worn hoses or a damaged radiator can allow coolant to leak and engine temperatures to rise. Keep an especially close eye on your vehicle’s temperature gauge during summer months to prevent overheating. Oil and coolant aren’t the only fluids that need to be checked to help keep your vehicle operating at peak efficiency during the summer. Your transmission fluid and power steering fluid should also be checked at proper intervals to make sure those systems work correctly. Also, believe it or not, gas evaporates more quickly from a hot car than a cold one—directly from the tank. Keeping your vehicle in the garage and parking in the shade when possible can actually prevent some of this natural evaporation, increasing your fuel economy. Wiper blades can actually melt to your windshield in high heat. The best way to prevent this is to put your wipers through a wipe-wash cycle from time to time. To keep yourself and your passengers cool, have your air conditioning serviced regularly. Replacing the cabin air filter can also improve cooling and prolong the life of your A/C system. Finally, an inexpensive sun shade can help protect the interior of your vehicle from sun damage—and keep it a little cooler on those hot, sunny days. Next post: Extreme heat can cause tire blowouts – Here’s some advice on how to prevent these blowouts.